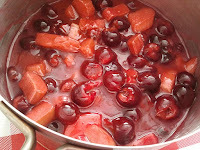 I recently posted an amazing sour cherry pie recipe. 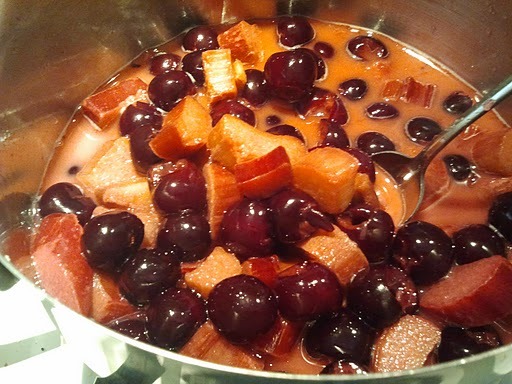 Now, the cherries for that recipe were supposed to make two pies. However, the pound to cup ratio in The Pie Bible by the pie goddess herself, Rose Beranbaum, was a little short...about 1 cup and half short on the second pie. So after a long search for sour cherries in any kind or shape or form, I gave up. So lesson 1-sour cherries are rare and totally seasonal. If you find 'em, USE them, love them..and buy extra! During my searching I heard of a great jarred sour cherry that Whole Foods may carry, so I took a quick trip over there. Unfortunately, no luck. However, the manager there was amazing (which, big shout out to the Whole Foods in Sauganash/Chicago. You guys rock with customer service!) and was giving me all kinds of advice. She was awesome and I pretty much was not going to be allowed to leave without a solution to my dilemma. It so happened their pastry chef was shopping in produce on her off day, and the manager introduced me to her. She suggested rhubarb as a great filler and compliment to the tartness of the cherries, and also recommended the organic, prechopped frozen in their freezer case. She said the extra liquid from the frozen rhubarb would give me great juice. 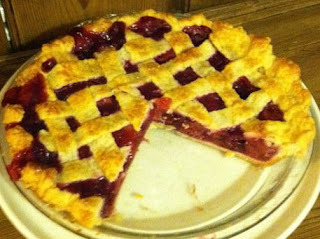 When I got home, I decided to see if The Pie Bible had any advice on working with rhubarb and low and behold, Rose B. had a whole recipe dedicated to cherry and rhubarb! I followed my previous recipe except for the following filling, and the pie turned out great. My friend who I made the pie for can attest to it. She said she had to hold her husband back from having huge second portions. Follow my cherry pie recipe until you get to the filling part. In a medium saucepan, mix everything but the Amaretto until well combined. Macerate for 15 minutes. Over medium high heat, bring the mixture to a boil, stirring constantly. Let simmer for 1 minutes, mixture will get thick. Take off heat, and let it come down to room temp. After about 15 minutes of cooling time, pour the Amaretto into the mixture, stir, and let sit to cool completely. Add to the pie shell when completely cool. Build the lattice tops described in previous post and follow the rest of those directions.